I don't really know what to make of this game. It feels like a slightly upgraded version of the last two weeks. The offense struggles until it doesn't (thankfully not in the red zone today), the defense is fast, furious, and aggressive, making life difficult for everyone on the opponent's offensive side of the ball, and Michigan fans are nervous and angsty until they're not. We only fret about things we care about. Even if those things are seemingly foolish or ultimately unimportant in the grand scheme of things, when we care, we worry. We worry when things don't seem to be going the right way, we are uneasy when something feels "off". So when Wilton Speight goes down (on an uncalled late hit) and is escorted out of Ross-Ade Stadium on a peripatetic search for an X-ray machine, we worry. When there are turnovers, we fret. When O'Korn looks OK, not great, we grouse. 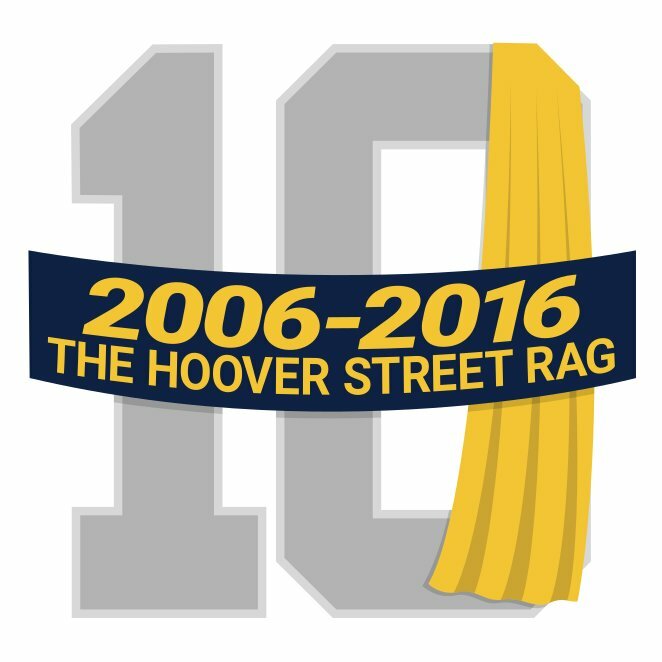 But I have a new working thesis, in re Harbaugh. I don't think Harbaugh intends for his teams to come out of the gate not necessarily firing on all cylinders, that would be foolhardy and potentially dangerous in the longer term of a game. I do think Harbaugh is OK with taking the best punches from an opponent, letting them show their cards, and then adjusting at halftime. I think this is the coach's son in him, or the Bo acolyte or some combination therein. It's not enough to have a plan, it's summed up in von Moltke the Elder's statement from On Strategy (1871): "The tactical result of an engagement forms the base for new strategic decisions because victory or defeat in a battle changes the situation to such a degree that no human acumen is able to see beyond the first battle." Every game has its own character. 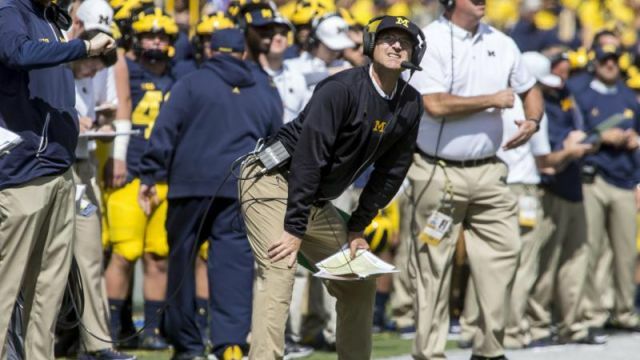 Harbaugh could not have planned for Speight to go down. He would have O'Korn ready to go in, but that is not the same as "OK, Speight's gonna get taken out on a sack." He allowed the game to find its ebbs and flows and was likely displeased, but not dishearted to be down 10-7 at the half. To everyone's relief, Michigan's defense flashed its claws. It allowed Purdue a grand total of ten yards in the second half, having given up 179 in the first half. But it was also the simple pitches and catches between O'Korn and the tight ends, coupled with some "find the hole, hit the hole" runs by the running back by committee and Michigan was cruising. (A couple of timely, if wholly fair, targeting ejections on the Purdue defense may have also helped things along.) People who didn't see the game, that will only see the final score, will see a Michigan team that went on the road against an upstart Purdue team and handled its business. They won't see the hiccups, or if they do, they'll see 21-0 second half, probably keep them around #7-8 in the polls and let Michigan head into the bye week 4-0 with the Battle for Paul Bunyan looming. I don't know how I feel yet about CFB on Fox, but that bumper that showed a flip-through of Michigan legends that ended in the Block M was nicely done. So, if Twitter is to be believed, Purdue's opposing locker room has no A/C and there's no X-ray machine at Ross-Ade. I think when we focus on mocking Rutgers, we do a disservice to our rightful questioning of Purdue's continuing position in the Big Ten. We keep calling Chris Evans "The Human Torch", because "Captain America" status must be earned, but man, we're getting close to handing him the shield. They won. So, I mean, right there, after the last decade, that should be a good feeling. Michigan swept through its non-conference schedule for a second consecutive year and heads into Big Ten play relatively healthy (we hope, waiting to hear on a couple of injuries) and with its young defense rounding nicely into the aggressive, attacking form we know a Don Brown squad would take. But, eight trips to the red zone with but one touchdown, Wilton Speight having not completed a pass inside the red zone this season, it's a cause for concern. All of the people who would know are throwing around the word "correctable", but I'm a little concerned that three games into the season, these correctable issues are seemingly no closer to being solved than when they first cropped up in Dallas. So I don't know. Expectations are a weird thing. We feel like Michigan should have won by more, and I suppose if the two Ty Isaac touchdowns were actually touchdowns, we might feel differently about a 38-13 win (all other things being equal, of course.) 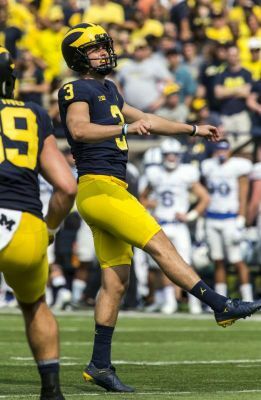 But instead, Quinn Nordin was like a Rockette during the Christmas season, kicking it on call for a Michigan record-tying five field goals in a game. I suppose there is a positive in knowing that Nordin is exceedingly solid as a college kicker, but settling for three so often is going to cost Michigan down the line. We know it, the players know it, and assuredly, the coaches know it. So how do you fix it? That I do not know. There are two realities here that I cannot deny. 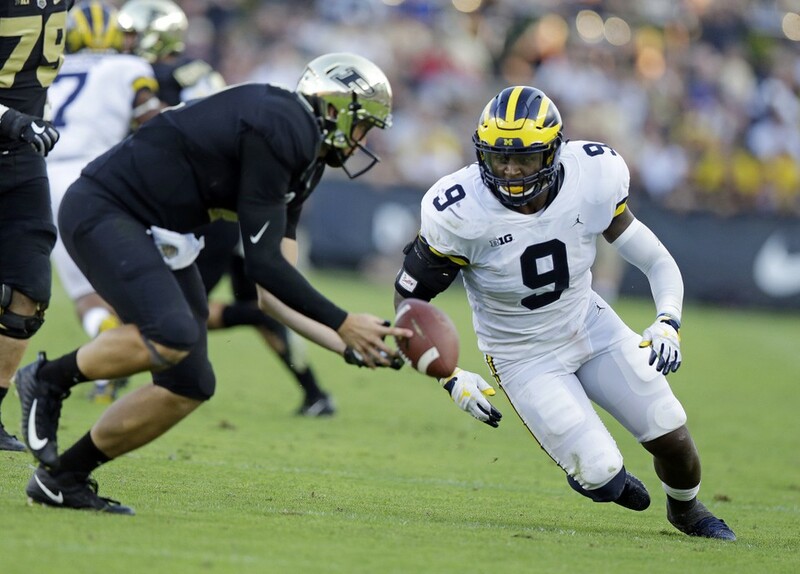 First, Speight has to be the best option at quarterback at present, or else he wouldn't be playing. Harbaugh's track record indicates the truth of this statement. It does not mean Speight is the best quarterback on the roster, simply that he is the best option at the moment. To that end, you have to find a way to make him better and quick. Part of that may be the protection on the O-Line, but he's got to be better. But he knows that. Everybody in the program knows that. But as Mr. Rogers taught us so many years ago, wishing does not make it so. So a date with a...resurgent? Purdue program in the Brutalist shrine that is Ross-Ade Stadium awaits. Michigan's defense has been as strong as anything, they'll need to be again. But let's hope that Nordin kicks more PATs than field goals next weekend. Or else it could be a long day in the wilds of West Lafayette. There was a time that Matt Millen was considered to be a top-tier color analyst for football, correct? Have we all just gotten better at knowing what a good analyst sounds like, or was he never really that good? Today was just brutal to watch on BTN, even trying to put my Lions' fan hat off to the side for Millen. We should probably stop scheduling service academies and their Franken-Hydra offenses...except that Army comes in for Week 2 in 2019. Fine, but after that, OK? This is sort of a lousy column, but today was sort of a lousy game, so I think we're even. So, instead, if you'll permit me, I'd like to diverge to a treatise on the notions of communities of which you are simultaneously a part, and yet, are completely anonymous within. While I did not get to spend my Saturday at the Big House, I did get to spent last Sunday on the floor of Ford Field for U2. This is the fourth time I've seen U2 live, and I am still one of the younger people in the crowd, which is a nice feeling when you've entered your 40th year on earth. U2 was there to kick off the fall portion of the 30th anniversary of The Joshua Tree tour they've been on this year, which included for me, more than anything else, the knowledge that they would be playing the album the whole way through, which meant they would be playing "Red Hill Mining Town" live, something they had never done before this tour. "Red Hill" is probably my favorite U2 song, with only "Bad" sitting right there in the conversation. So while I waited in anticipation of the moment, U2 opened their set with "Sunday, Bloody Sunday", "New Year's Day". "Bad", and "Pride (In the Name of Love)". The crowd was immediately into it, and I was struck that I was surrounded by people who were there to celebrate the band and their music and what it has meant to them. It was in varying degrees, but it was the root of what was going on. The most fascinating part of it was listening to the crowd sing along with songs they have known for over three decades, for the most part, hitting every syllable, every inflection, every moment in unison, even if Bono was playing around with the lyrics himself. So, there we were, surrounded on a football field by music, by emotion, by a community, where instead of being alone with everyone, you were with everyone, but on your own. In this sense, it struck me that communities of fans are simultaneously familiar and unknowable. We have something in common with the person next to us, but the meaning for them may be completely different than that person than it is for you, or it might be very similar. You will be lumped together by other people who don't really know anything about you, and yet, you may not like the fan next to you. But we are united by that which you share, even if that which divides you is also frustrating. That is fandom. Sports are not necessarily a form of art, but they inspire passion and evoke emotions in people. This builds communities of fans and followers. Nick Hornby explored this ground in a number of his early works, after all. This game was a mediocre album, maybe one or two solid singles, but lacking the depth to make it a classic. Let's hope next week is a return to form. It took perhaps a bit too long, but the final nail eventually came, fittingly, from the defense. All summer, the focus was on what was missing, the ten starters on defense gone, the opportunities at the end of the season lost because of a failure to be able to close out with a lead. It makes sense, they were, after all, things that were objectively true. But at the same time, they were also misleading. Michigan was missing a lot of starters on the defense as it headed down to Arlington, true, but Maurice Hurst and Rashan Gary were not starters last season, to focus on one really positive interpretation of facts as Michigan headed down to Arlington to face Florida and perhaps exorcise some of the demons of JerryWorld. After all, it was five years (and one day) since "The Hammer". We quickly were reminded of the joys of targeting calls on the first play, when Devin Bush hit a Florida player late out of bounds, and then it was determined that he did not, in fact, lead with his helmet. That ten-minute delay as we sorted things out lead to a big Florida passing play, and while the defense stiffened in the red zone to hold the Gators to a field goal, it was not a welcome potential portent of how the day would go. It also turned out to be a false reading of the defense's abilities. Michigan put together a solid opening drive that ended in a Quinn Nordin field goal, which came only after the officials called an ineligible man downfield penalty that was misidentified on Khalid Hill, who had motioned out of the backfield. That Michigan fan doubt crept in, would it be a loss where all of the moments could be written down in a bullet pointed list that led to a game that just slipped away? Shortly after Wilton Speight found Tarik Black for 46 yards on a busted coverage for a TD, it felt like that was just all paranoia. Until it didn't. Two pick sixes, one off a deflection from Kekoa Crawford's hands, the other from a Speight overthrow of Grant Perry, all within 79 seconds of each other, and it really began to feel like Michigan was going to give Florida the win rather than use their aggressive defense to stifle a Florida offense that never really got moving and was missing a bunch of playmakers due to suspensions. One of the things I most love about the Harbaugh era is that I know halftime adjustments are coming. I know they are coming like the article of faith that it was in my youth, that Bo's teams were second half teams, they would adjust at halftime and the depth would wear you down, and they would seize control again. For a long time, even going back to the Carr era, this was not as much the case. Scholarship limits played a role in that, but it also comes down to having a staff that can see things and finding ways to adjust, knowing that the other team will be adjusting as well. When Michigan came out and took the opening possession of the second half 75 yards on ten methodical plays and took a lead they would never relinquish, it felt like things were going to be OK. Nordin's steel toe was bombing field goals from beyond 50 yards, and while it would be nice to turn these drives into touchdowns, Florida wasn't exactly moving the ball, even with a switch the Notre Dame transfer Malik Zaire at quarterback. But Michigan was stuck on a nine-point lead for 23+ minutes of game time. Nordin missed a couple of field goals that would have made it a two touchdown lead, but Florida's offense ran 21 plays for 36 total yards before a series where a Michigan punt had pinned them deep in their own end of the field. Finally, the combination of Khaleke Hudson (with the sack), Chase Winovich (with the strip), and Noah Furbush (with the recovery for the TD) attacked Zaire one last time, and Michigan put the game away, one in retrospect they had dominated save a terrible 80 or so seconds.